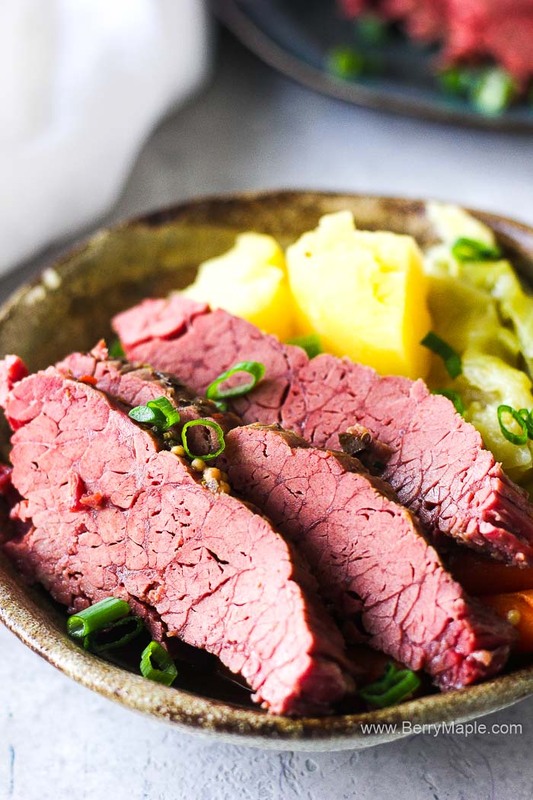 Juicy, flavorful Instant Pot corned beef and cabbage is fantastic dish that is great at any time of the year, but especially in March, for St. Patrick’s day! So easy, dump and start recipe will prove you that your pressure cooker is amazing for everything. 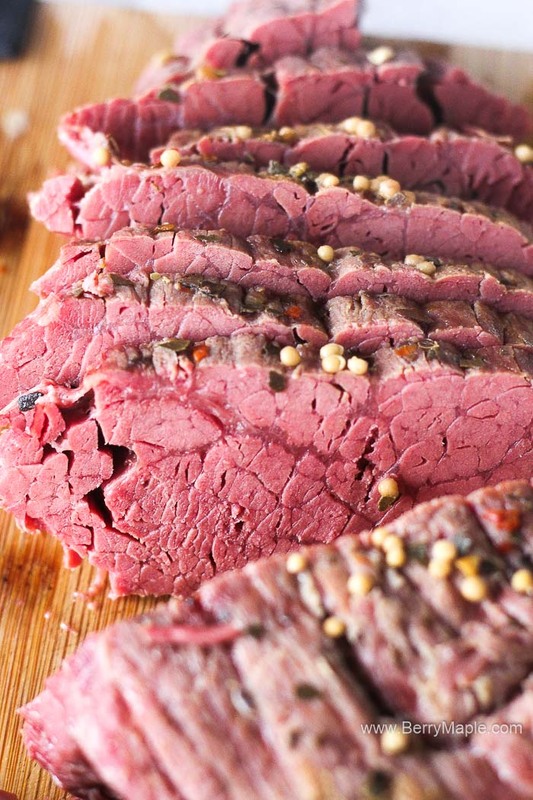 We all know that cooking corned beef is a long process, that usually end with a tough dry meat. 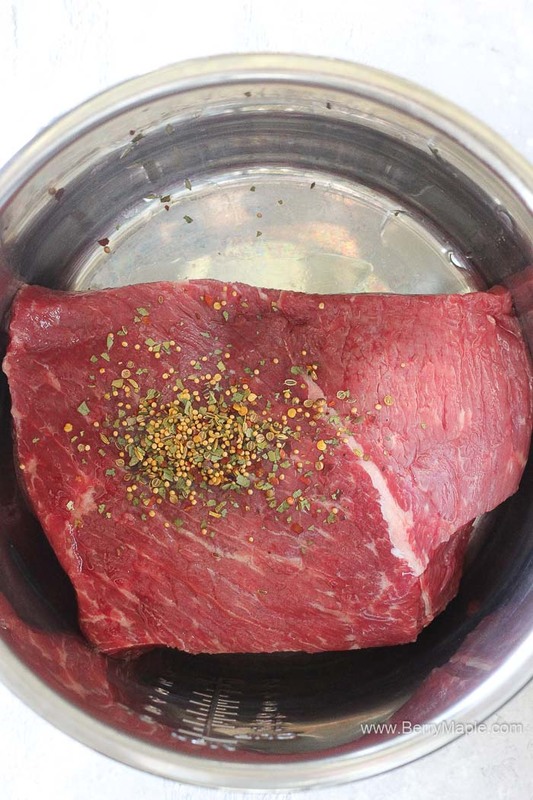 Beef brisket is not the softest cut of meat and it takes hours to cook it right. I love to cook beef in pressure cooker though, it makes it nice and soft, like in these instant pot Beef and vegetable soup or instant pot beef lettuce wraps. 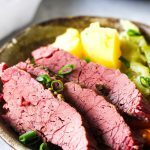 How to cook corned beef in Instant Pot. 3 cups low sodium broth. Any broth will work, chicken, beef or vegetable. Just make sure its low sodium! 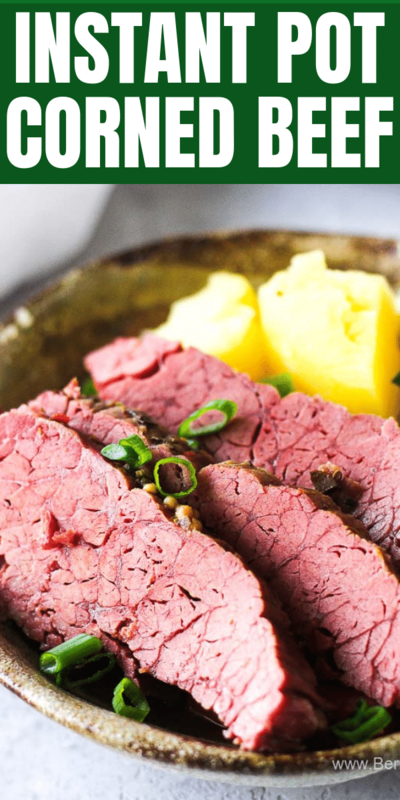 Wash the corned beef and place inside your instant pot. I have a 8 quart instant pot but 6 quart will work as well. Add spices, water and broth. I used a low sodium chicken broth, really liked it! Let is cook on manual and high pressure for 90 minutes. Quick release the pressure ( be careful, because you can get some foam coming out of the valve). Transfer beef brisket to a cutting board and wrap it in foil to keep it warm and juicy. Meanwhile, add all your vegetables into the same pot with broth and cook for 10 minutes on high pressure. 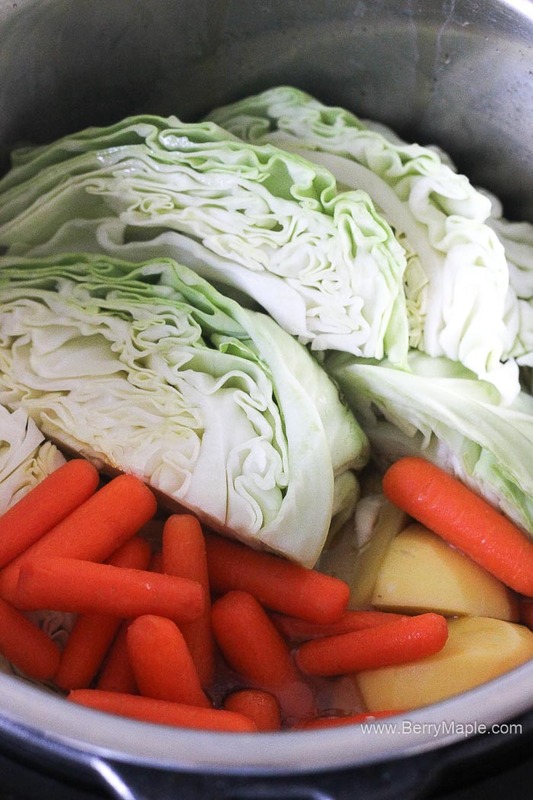 Again, make sure that cabbage and potatoes are cut in big pieces, otherwise it will get too soft. Quick release. Cut the beef brisket and serve with vegetables. Delicious! There is a lot of stores that sell corned beef. Especially before the st Patrick’s day. I like to buy mine in Costco, its available all year around and is very reasonably priced. Costco never sells cabbage though, so i always have to stop by another store to get it. Another option is to get the meat through ButcherBox , they actually have a deal right now, get 2 FREE Filet Mignons, Bacon & $10 off your first box. Pretty amazing and good value. 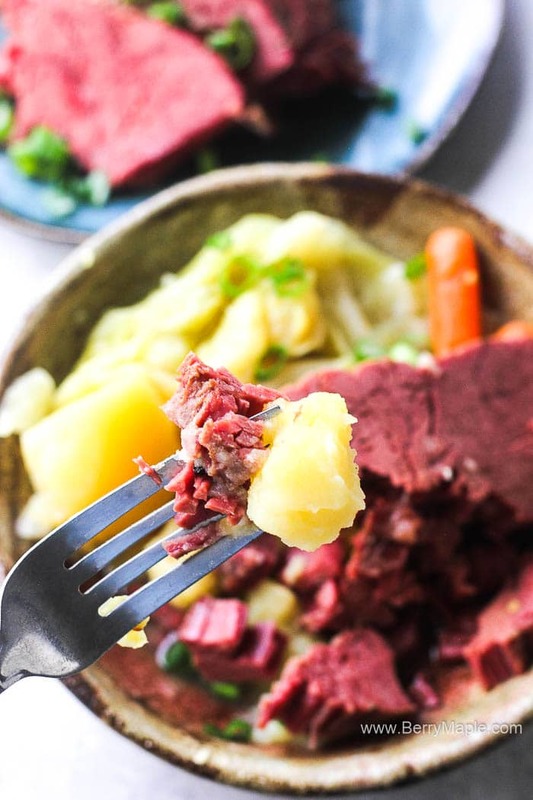 Juicy, flavorful Instant Pot corned beef and cabbage is fantastic dish that is great at any time of the year, but especially in March, for St. Patrick's day! So easy, dump and start recipe will prove you that your pressure cooker is amazing for everything. Rinse the brisket very well to remove the extra saltiness. Place into the instant pot with all the spices, broth and water. Take the corned beef out and wrap in the foil. Peel and cut potatoes in halves or quarters, or keep whole if they are small. Peel and cut carrots in big chunks. Cut cabbage in 8 pieces. Add veggies in to the broth, close the lid and cook on high pressure for 10 minutes. Quick release. Open the lid, using slotted spoon take vegetable out. Slice the brisket against the grain and serve with vegetables. In this recipe i used a spice pack the meat came with.